The Rose Tree Park HawkWatch (RTPHW) became an official hawk watch site on August 14, 1999 after several years of trial counts to see whether the location would be a viable site. Nick Pulcinella originally started counting at Rose Tree Park as time permitted in the fall and then added spring to his casual counts as well. As a result, Rose Tree Park became a common gathering place for birders during favorable migration periods in both the spring and fall. A trial count was conducted in the Spring of 1999 and the site was staffed on a daily basis over a period of time. Dave Washabaugh along with others put in long dedicated hours to demonstrate that Rose Tree Park would be a viable hawk watch site. In the summer of 1999, Dave Washabaugh and Jim Lockyer made the contacts that enabled RTPHW to become part of the National network of hawk watches formalizing its status. The RTPHW currently operates a Spring and Fall hawk watch and is staffed daily, weather permitting, in the spring (mid March through April) and fall (mid-August until mid-November) of each year. RTPHW contributes data to the Hawk Migration Association of North America (HMANA), BirdSource and BirdWatch at Cornell University, and to Hawk Mountain Sanctuary. In the spring of 2001 RTPHW was added to the Hawks Aloft Worldwide database for being noted as a "significant and active hawk watch site." The basic philosophy at RTPHW with regards to hawk watching is that the activity of hawk watching should be a fun and learning activity. We have already gained a reputation for adhering to that philosophy. All are welcome to join in the comradely and fun that is associated with the hawk watch. It's a great place to learn more about identifying birds on the fly, and birds and birding in general. Please feel welcome to join us and please don't leave your sense of humor at home. RTPHW also offers onsite educational opportunities to local all grade level schools. Please contact Holly Merker for more information regarding this program. 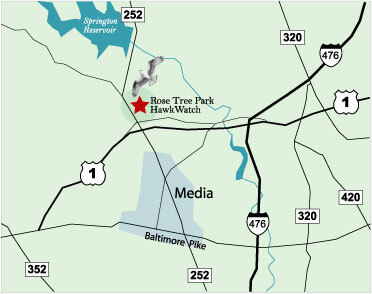 The Rose Tree Park HawkWatch is located in Rose Tree Park, Media, Delaware County. Fall watch is conducted from a location near the park gazebo.